Novellas: movies you can read. That’s essentially the pitch. Novellas are books usually in the 20-40k word count range. 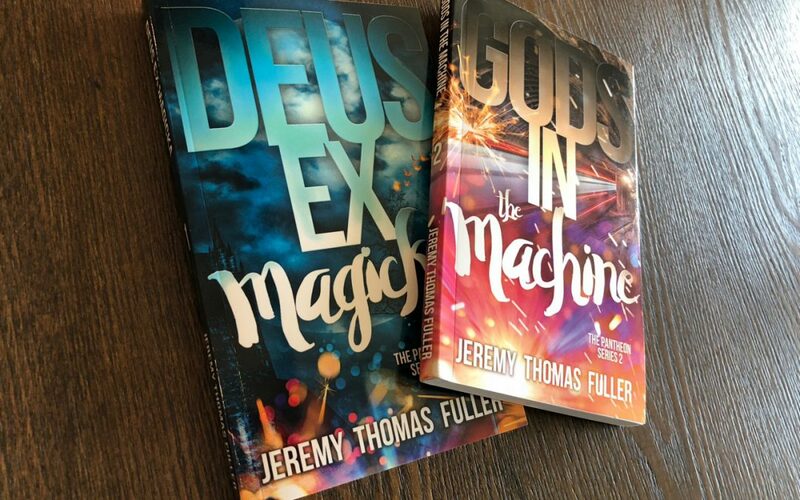 DEUS EX MAGICKA is 192 pages long in paperback, and GODS IN THE MACHINE is an even slimmer 170. These are books that take 2-4 hours to read depending on your speed. They’re bite-sized chunks of entertainment. And they’re a hell of a lot of fun. One of the strengths of novellas is that they can be read in one sitting if you so desire; and, more importantly, the entire plot can generally be kept inside your head at once. Full-length novels are more complicated: there is so much plot, so many characters and complications, that it’s often impossible to remember everything at once as a reader. In novels, authors like me employ tricks to get you to remember the pertinent things we need you to remember at the moment we need you to remember them. And while I still use these same tricks in my novellas, it’s a lot less necessary. This has benefits both to the author and to the reader. I spend less time repeating things, and you spend less time wondering what in the hell I’m talking about. Simple: plot yourself a novel, but with one viewpoint character and no sidequests. That’ll probably get you there. We fantasy writers love multiple viewpoint books (and they’re extremely powerful, but I’ll save that for a future post). Just by dint of removing all those extraneous viewpoints, you as a fantasy author have probably gotten yourself down to 50k words of plot or less. Now just leave out all the sidequests, too, and you’ve got yourself the right length. Note what I didn’t say to take out: don’t dumb down the conflict. Don’t eliminate the character arc. Don’t alter the structure in any other way, in fact—I still loosely follow the Seven Point Plot Structure even for my novellas (though I tend to simplify it to something closer to Three Act Structure). It’s important that you continue to use foreshadowing, that your character go through a Transformation, that your book contains a Darkest Night, that you solve the plot using a combination of clever (foreshadowed) mechanics and the character lesson that was learned. Do all the same things you do in a full-length novel, just do them with one character and without any distractions. Novellas are a lot easier to visualize in your head. Not just the reader’s head, but your head. And I don’t mean the visuals of the story—I mean the plot. When you can keep the entire plot in your head, it’s a lot easier to craft compelling, compact story arcs that really work. It’s also a lot easier to spot problems when they arise. Perhaps the primary downside I’ve encountered is the shortened character arcs. There isn’t room for a lot of nuance or lengthy development, which can lead to your Transformation moment feeling a bit unearned. It’s important that you compensate for this by littering the text with pieces of the arc—otherwise, readers aren’t going to buy that Transformation when it happens. Another downside is the lack of multiple viewpoints. Sure, you could do a multi-viewpoint novella, but then you’re even further limiting your plot and character arcs. For me as an epic fantasy writer, single-viewpoint books are just much, much harder to execute. With a novella, you have no choice. That means you need to get good at pacing, at varying the setting, at keeping things moving and fresh. Novellas are notoriously hard to publish, or at least they were for a while. They were quite common in the early days: A Christmas Carol, A Clockwork Orange, The Strange Case of Dr. Jekyll and Mr. Hyde, and Of Mice and Men are some prime examples. Even science fiction and fantasy have gotten into the act: The War of the Worlds, Ender’s Game, Dragonriders, and Coraline are or originally were novellas. But the format has struggled to find a place on traditional bookstore shelves—it’s too expensive to produce, and readers aren’t willing to pay enough money to make it profitable. Enter self-publishing and print-on-demand paperbacks, and you have a winning formula. This is where I’ve placed the PANTHEON series, and it’s where thousands of other authors have found a home for their worlds. But that’s not where the story ends. The novella and short novel format (let’s call that 50-60k words) is gaining steam out in the real world, but not where you’d expect: James Patterson’s BookShots imprint specializes in small books that go in grocery stores. It’s a marker of what we already knew: that the world is only interested in short experiences, entertainment in a flash, and the novella is perfectly positioned to that end. It gets you much of the complexity of a novel while still being digestible in a short period of time. It’s a distillation of the craft of novelization, and I highly recommend that if you haven’t tried writing one yet, you do. Sometimes size matters, but not in the way you think.